Organic waste mostly comes from food waste, which has characteristics of high concentrations of nitrogen and fat, and high humidity. Domestic waste in Indonesia has a high organic content, which is suitable for anaerobic conditions. Waste oil and fat can be used as co-substrates and are helpful in yielding biogas in an anaerobic digestion (AD) process. The aim of this research is to analyze the performance of a food waste dry anaerobic digestion reactor after the addition of fat oil and grease (FOG) waste. The research was conducted using a semi-continuous stirred tank reactor (SCSTR) with an active volume of 400 L, operated at an average temperature of 27.8±1.07oC. Two experimental scenarios were performed, using varying types of food waste, food waste with cow dung as substrate, and FOG waste as co-substrate. The experiment was conducted using an Organic Loading Rate (OLR) of approximately 10 kg VS/m3, with a constant mixing intensity of 30 rpm. The results show that there was a significant difference between the input of food waste substrate with and without the addition of FOG (p<0.05). The average reduction of volatile solids (VS) and chemical oxygen demand (COD) removal in the substrate input with FOG addition was higher than without the addition. The mean percentages of COD removal and VS reduction in the substrate input with FOG addition were 63.3±2.71% and 89.30±1.55%, whereas those for substrate input without FOG addition were 59.45±4% and 77.65±1.46%, respectively. 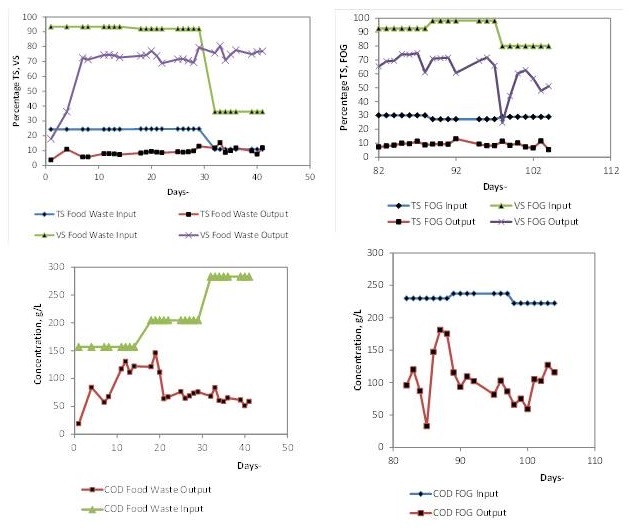 The study concludes that the use of FOG as a co-substrate in a dry AD food waste reactor is not only beneficial in reducing FOG waste generation, but also has a significant impact on reducing COD and VS, which can enhance potential biogas yield. Solid waste is any waste product arising from the activities of humans and animals. It is normally in solid form and disposed of when it is not wated for reuse; it contains both organic and inorganic waste components (Tchobanoglous, 1993). The average level of waste generation in 23 developing countries is about 0.77 kg/person/day (Troschinetz & Mihelcic, 2009). This high rate of waste generation has great potential for reuse or recycling at source in order to reduce the volume of final disposal into landfill. One of the waste fraction that can be reused as compost or energy is organic waste (food/kitchen waste). In general, solid waste in Indonesia has a high organic content of about 60.5?80% of the total waste generated (Damanhuri & Padmi, 2010; Aprilia et al., 2013). It is derived from municipal food waste, which has characteristics of high nitrogen and fat concentration, high pH and low humidity, which cause problems for its application in waste processing technology (Zarkadas et al., 2015). Moreover, domestic waste in Indonesia has a high organic content, which makes it suitable for anaerobic conditions with an organic loading rate (OLR) of around 3.2-32 kg COD/m3day (Metcalf & Eddy, 2014), and pH values ranging from 6.5?8.2 (Zhai et al., 2015); it would therefore be more effective to treat domestic waste with an anaerobic system. Food waste degrades well and forms biogas due to optimum nutrition, temperature, pH and anaerobic conditions (Gomez et al., 2006). One of the widely used technologies for processing domestic waste is anaerobic digestion (AD). The main characteristic of AD is that it is specifically used to convert waste to energy from various biodegradable sources of organic solid waste. The AD process contributes efficiently to reducing waste and waste production (Metcalf & Eddy, 2014). Many researches have studied the use of anaerobic digestion (AD) to convert waste to energy from various types of reactor (Kothari et al., 2014; Zarkadas et al., 2015; Tassaka, 2016; Kurnianingsih & Priadi, 2017), with a range of varying substrates and co-substrates (Gomez et al., 2006; Zhang et al., 2013; Zhai et al., 2015; Afifah & Priadi, 2017). The co-substrate is a very important parameter that can accelerate the decomposition process and which affects biogas formation. However, very few researches have focused on the use of fat and oil grease (FOG) as co-substrate (Davidsson et al., 2008; Kabouris et al., 2009; Martin-Gonzalez et al., 2010). This research aims to utilize the unused FOG waste from domestic activities as the co-substrate of food waste dry anaerobic digestion. The novelty of the research is that it investigates the effect of substrate and co-substrate variation on AD performance. The performance of the dry anaerobic digestion food waste reactor had an average temperature of 28.38oC (mesophilic), and average pH of 6.5±0.06. The input of food waste substrate had a COD value of 218.98±9.9 g/L, which decreased at output to about 79.7±5.50 g/L. High COD concentrations indicate that the substrate used has the potential to be treated using an AD reactor. The addition of FOG waste to the dry AD reactor noticeably maintained average pH, although it was not significantly different in the first scenario, at about 6.3±0.03. In addition, the value of COD removal due to the addition of FOG waste was not significantly different, at about 88.4%. The average COD value at the inlet was higher than at the outlet during the addition of FOG waste, at about 230±1.4 g/L and 104±7.7 g/L respectively. The average VSD value in the first scenario was smaller than in the second, at about 77.6±1.46%, while the highest VSD was found in the second scenario, at about 89.3±1.55%. In addition, the COD removal of gas formation was found to be inversely proportional to biogas production. The AD operation in dry conditions with TS content was found to be greater than 15%. In this study, the addition of FOG waste did not produce any significant increase in biogas production at the initial stage, but at the end of the fourth day significant differences (according to the t-test statistic of p<0.05) were shown. This might have been caused by the fact that FOG waste has the property to behave as an inhibitor. The authors would like to thank the Directorate Research and Community Service Universitas Indonesia for providing the International Indexed Publication Grants for Students’ Final Project (Hibah PITTA) No. 824/UN2.R3.1/HKP.05.00/2017. We would also like to thank M. Irpan Sejati Tassakka for the valuable discussion and Septiana Kurnianingsih and Ismail for the collaboration in feedstock loading.